What should I do to let syncthing complete the sync operation? Check the logs for errors potentially, especially if all items are actually there, but still with the temp file prefix/suffix. Permission issues. Will check the other thread about freenas permission issues. Problem solved by using UNIX permissions on the freenas dataset. Actually, this issue is duplicate of Large repo synced but only tmp files received. The root cause has been discussed in the freenas forum https://forums.freenas.org/index.php?threads/cant-chmod-files-operation-not-permitted.22229/. 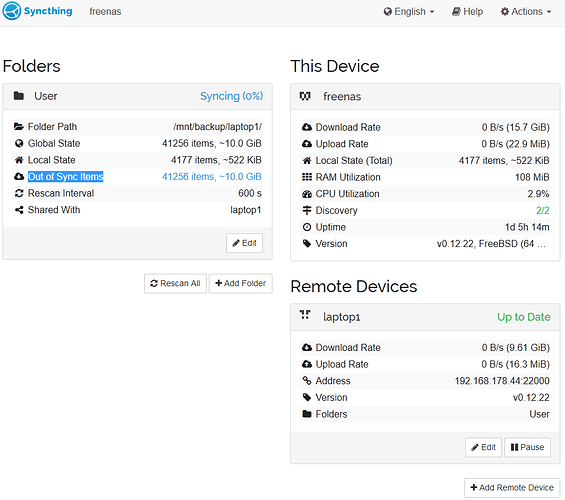 For further reading search https://www.google.com/search?q=freenas+syncthing+permission+chmod. TL;DR: freenas does not support chmod with Windows permissions. Windows ACLs are stored in extended attributes so chmod is disabled as a safety to assure consistency in permissions. Syncthing fails the download if a final chmod fails. For syncthing trying setfacl when chmod fails would elegantly get rid of this issue. Should I open an enhancement request for this? We don’t support syncing ACLs, but there is an issue for it somewhere. Without that I don’t it makes sense to do setfacl calls. Another workaround would be to disable syncing permissions, by the way.